Martin Maruskin blog (something about SAP): Can’t navigate in SE80 because left part of screen (tree) is too small? Can’t navigate in SE80 because left part of screen (tree) is too small? I experienced this situation couple of times. 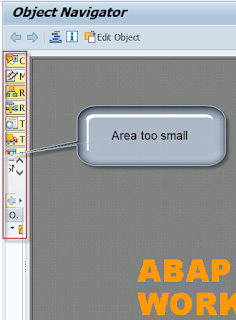 By accident I made left part of SE80 (ABAP workbench or Object Navigator) screen so small that I couldn’t use the SE80 anymore. The left par basically allows selection of repository with which developer works subsequently object type selection and so on… Without access to that area no productive work can be performed. The reinstallation of the SAP GUI doesn’t help as this information is persistently written in SAP backend system for every user. The table where the information is residing is called RSEUMOD. The table consists of all settings for ABAP Workbench which are normally maintainable via menu of the SE80 -> Utilities -> Settings. However, the particular settings related to width of the area is not present in the settings. navigator in pixels. Therefore, only solution is to adjust it manually via tcodes like SE16N. The name of respective parameters is WIDTH - Width of navigator in pixels. Number of pixel for TREE control on the left part of RSA1 (monitor of info packs). Useful to e.g. it in case it is too small and user can’t navigate e.g. can’t be enlarged. Any value below 50 has no meaning. I suggest to put value like 300 to make the area perfectly visible.